Stephen Jacob Smith is back, this time arguing that Two Trees’ Domino plan is somehow flawed because the upland zoning in Williamsburg is not dense enough. Where to begin – again? A block or two away from the old Domino refinery, the skyline plummets to near zero—most sites across the street are zoned exclusively for industrial use, and cannot be developed beyond one and two stories. There is no gradual downward gradient. Because the 2010 Domino zoning was a spot zoning – a really large one, but still spot zoning. When originally proposed in 2006 or so, the Domino rezoning actually included most of the surrounding industrial blocks. This made sense since the only reason those blocks were left out of the 2005 rezoning was because at that time Domino was still operational and had no plans to cease being so. Why did CPCR and the City take those blocks out – I have no idea, but it certainly wasn’t because of local “anti-growth” attitudes. 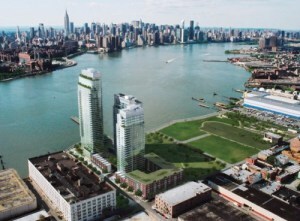 High-density building is allowed more than half a mile from the Bedford Avenue L, on the waterfront, but no housing is allowed at all on the blocks immediately adjacent to the Morgan Avenue stop. And it’s the pre-war neighborhoods, which sprouted naturally closest to the L, where residential development was most restricted in the rezonings. OK – first of all, development did not sprout “naturally” along the L train. The L train was constructed as the Canarsie Line in the mid 1920s – well after 90% of the surrounding development, particularly that in the Northside, was constructed. The L train was a late addition, meant in part to connect the existing working class and industrial neighborhoods of Brooklyn to one another (and to Manhattan). One of those industrial neighborhoods was near the Morgan stop. That area is zoned industrial because it is a historically industrial area directly adjacent the canals of Newtown Creek and the LIRR freight spur. Maybe that zoning is outdated (I don’t think so, though I do think many other industrial areas are), but singling out one subway stop when the five stops before and the five stops after are in largely residential zones (some without those pernicious height limits) seems like cherry picking. Looking at the photo to the right, you might be forgiven for thinking Smith has a point. But contrary to what the caption says “density differentials” are not that “par for the course on the waterfront.” The photo itself isn’t even real – it is clearly a rendering (by Toll Brothers, I assume) showing the full build out out of Northside Piers (the tower at left is just now under construction). To the north of Northside Piers is the Edge (3/4 of which is built out) and beyond that a park (because when you rezone a neighborhood for a population increase of 30,000, it helps to add some open space). And to the north of that is some low-scale industrial stuff that is also slated to become a park (that’s another story). Meanwhile, across Kent Avenue, most of the low-scale blocks shown in this rendering have been redeveloped or are in the process of being redeveloped, for 6- to 7-story residential. Even the hulking block-long building to the south of Northside Piers has been redeveloped – it now houses 242 residential units. All told, there are well over 1,000 new housing within two blocks of Northside Piers that are not shown in this image, and the density (not height) differential between the buildings on one side of Kent and those on the other is not really that dramatic. This trope that low-scale neighborhoods are de facto low density is getting really tired, and no matter how many times Smith says it, it doesn’t make it true. As I pointed out the last time Smith raised this idea, there are actually a lot of unused development rights within the existing zoning for Williamsburg and East Williamsburg. A quick back-of-envelope calculation shows that much of the area is built to about two-thirds or three-quarters of its allowable floor area. And that’s just the existing housing stock – the two to (usually) three or four story vinyl-clad houses Smith abhors (but which, interestingly, people are willing to pay dearly for, and use as is, even when they are underbuilt by 50% – stupid market). And this doesn’t begin to take account of the thousands of housing units at “projected development sites” identified in the 2005 rezoning that remain unbuilt. So even without rezoning for increased density, there is a lot more density to come. And capacity for plenty more built into the system.